If you like good beats and rhymes, you will like this record. If you like lyrics about selling cocaine, you will really like this record. 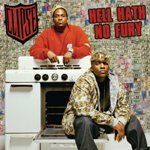 On Hell Hath No Fury, Clipse further the marriage between rapping and “pushing weight” with style and finesse. Just when it seemed that every avenue of word play had been explored in regards to talking about coke, Virginia brothers Malice and Pusha T legitimately raise the bar while glorifying the lifestyle. brotherly rap duo have consciences. “Sorry Heavenly father/Once again I hate to bother/Its ‘P’ the evil creeper sending some to the grim reaper/Meanwhile me and my mistress like Solomon and Sheba,” raps Pusha T on “Mamma I’m So Sorry.” They make clear, however, that they are young, rich and more concerned with Bapestas and Ferraris, so they’re going to enjoy it while they can. their frustration in dealing with Zomba Records, which constantly delayed its release. But now, with Hell Hath No Fury finally out and drawing universal acclaim perhaps Clipse might find peace now with their moral dilemmas. This entry was posted in Reviews and tagged Clipse. Bookmark the permalink.